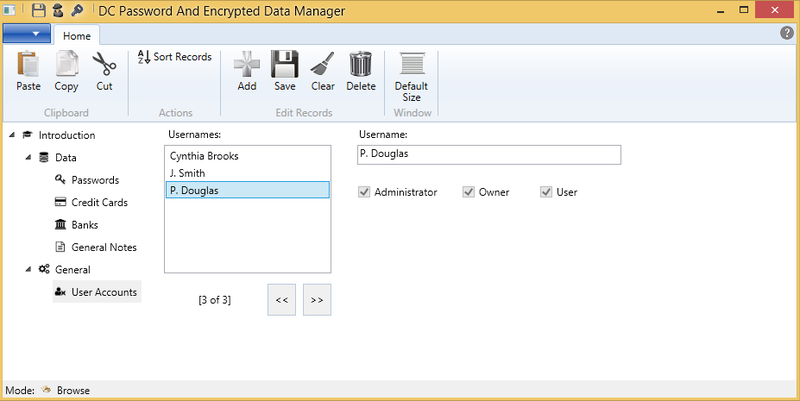 DC Password And Encrypted Data Manager Doc - User Account Records - Douglas Computing, Inc. When you click on the User Accounts node of the navigation tree, on the left of the DC Password And Encrypted Data Manager, you will see the following screen. This section of the application, allows you to manage users of the program. You can add and delete users, and you can update their names, as well as specify if a user has administrator privilege. A user needs administrator privilege to access this feature. Please note: that you cannot delete the user who initially logged into the application, who is regarded as its owner. The only thing you can change about the owner of this application, is his name. Also, an administrator who is not the owner of this application, cannot delete his own record, or update his roles. Please note the following regarding how you can manage User Account records.